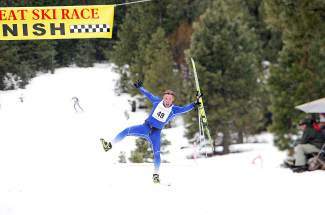 Gus Johnson crosses the finish of the 2013 Great Ski Race despite losing a ski. The Great Ski Race, which has been canceled due to a lack of snow the past two years, is one of many Nordic races held in the Truckee-North Lake Tahoe area. 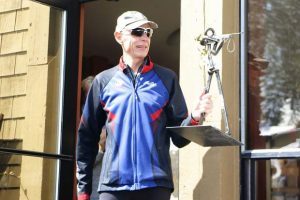 The Far West Nordic racing season kicked off this past Sunday with the Tannenbaum 10K Classic at the Tamarack Lodge near Mammoth Lakes. While Mammoth local Connor Kusumoto took the win in a field of 23 adult racers, the North Lake Tahoe area was well represented by Peter Hanson of Incline Village and Peter Mayfield of Soda Springs, who placed fifth and sixth, respectively. 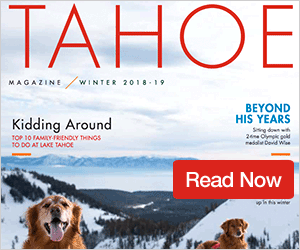 Like every winter, the 2015-’16 season is packed with races at cross-country resorts throughout the Truckee-Tahoe area, including the Auburn Ski Club, Sugar Bowl/Royal Gorge, Tahoe Donner and Tahoe Cross Country. Next up on the calendar are the Tahoe Mountain Sports Holiday Sprints and the Snowshoe Thompson Classic, both at the Auburn Ski Club, this Saturday and Sunday. Registration, along with a complete season schedule, is available at farwestnordic.org. — Out-of-area races not included. Locations and dates are subject to change based on snow conditions. Find a complete race schedule at farwestnordic.org.